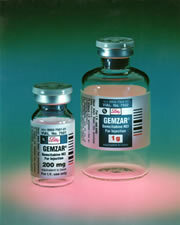 Gemcitabine is commonly used to treat pancreatic cancer. It is a colourless fluid, which is usually given by intravenous infusion(through a drip) with each infusion usually lasting around 30 minutes. You will often be given anti-sickness drugs (anti-emetics) at the same time. Intravenous infusions are given through a thin, short tube (cannula) put into a vein in your arm each time you have treatment. Alternatively, you may have a central line, a portacath or a PICC line inserted just before your treatment starts. These are tubes that give the drugs directly into a large vein in your chest and will stay in place as long as you need them. Usually the side effects of Gemcitabine are relatively mild.